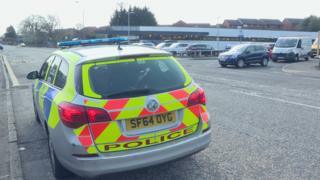 A teenager is in hospital after being stabbed outside an Aldi store in Edinburgh. Police are treating the attack on the 16-year-old, who sustained serious chest injuries, as attempted murder. He is receiving treatment at Edinburgh Royal Infirmary after being attacked in Gilmerton Road at 17:15 on Sunday. Emergency services cordoned off the area and the road was closed between Ellen's Glen Road and Moredunvale Road for almost four hours. A spokeswoman for the force said: "Inquiries are ongoing and officers are currently following a positive line of inquiry." Police said an officer was guarding a house in Gilmerton Road, opposite the Aldi store, in connection with their inquiries into the attack.